So, as the author, am I really an authority on whether YOU'll like it? I'll only say this. 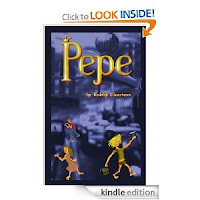 I have about about eight novels, novellas, shorts -- whatever -- available on Amazon, and in my opinion, PEPE is my best one. It's certainly better than THE WRONG TIME, which appears to be getting the most downloads right now. It's a cyberpunk novel -- perhaps a bit of crossover to fantasy -- set in 2020. Pepe is a homeless street boy who doesn't know his true identity. In the course of the story, he lives in places you'd typically find them: before the fire, in a vast slum community named the Dockyards (which is one of the central locations); later, an abandoned multi-story construction site with other homeless kids; and then, a shelter for homeless children, Mercy House, which I've based on Mercy Centre, Bangkok, where I worked for a year. Everywhere he lives, he has his sister, Po, with him. She's two years younger, she's not his biological sister, but he knows he's gotta take care of her. I've described the life of street kids as closely as I can without making the story dreary and dismal. There's every type: Pepe's and Po's "grandma" died when their home was burnt in a slum fire; there's Jose, the drug addict, who ran away from an abusive dad; and Raquel and her six-year-old twin brothers, Pierre and Michele (don't worry -- no tiresome comedies-of-errors). Their mother abandoned them after their dad went to prison. They are French/African. Raquel is a colourful character. I loved doing her. The story is set in the fictional Southern European nation of Cardovia, with a history that goes back thousands of years. Cardo, the founder and first king of the dynasty, once paid a visit to King Solomon and received a special gift from him. This, and the character of Atsuko, the aged Japanese mystic, give the story its fantasy edge. ...And it's Cyberpunk: The blurb above said that the General's brain had been wired to a network of computers and robots. You'll see that that can definitely have its disadvantages. Unbeknownst to his dad, Raul is a hacker. His dad is an army colonel, one of the General's top commanders. Their family is typical upper-crust -- the opposite end of the spectrum from Pepe and Po. Things get precarious when Raul hacks into the Generals computer system and realises what kind of person he really is. Rich kid meets poor kid: We see the typical attitude of rich kids towards "low-lifers", but things happen. A relationship slowly develops until Raul, Pepe and Po are the closest of friends. He enters their world as one of them. At the same time, in front of his computer terminal and VR set, sometimes accompanied by Pepe, he makes discovery after amazing discovery. Puzzle pieces begin to fit together, until suddenly he realises the danger Pepe is in. In fact, it might be too late...I'll stop here. I'm giving too much away. There are no superheroes. Everyone's thoroughly human. Perhaps the closest thing to a superhero is Atsuko, but even he has his limitations. But, everyone does what it takes to give the story an ending that should be thoroughly satisfying. What's the Gospel about -- Kingdom or After-life? Does the New Testament call Jews "Christ Killers"? Review of J. A. Konrath's novel, "Origin"